Born 4th March 1912 died 5th June 2006. I was rather surprised, but pleased, to be asked by Mannie’s family to say a few words today. Most of you have known Mannie for much longer than I have, but it is because of my direct connections with him through the Institute, the church and Woodborough Feast Celebrations that I have been asked to speak. As I mentioned at a recent event in the Institute, had it not been for Mansfield Foster, I doubt whether the building would have survived and flourished as it does today. Following the war and its use by the government, the Institute was in a very bad state of repair. Mannie, at the request of several villagers, approached the owner – Mr. Charles Hill of Woodborough Hall – and persuaded him to let the village have the building as a community hall for social events and meetings. Single-handedly Mannie persuaded people to donate furniture, fittings and equipment. Over the years he raised funds to run and maintain the building. He put on a new roof, decorated, had a new toilet and disabled ramp built and much more. He cleaned out the coke fire daily and lit it in preparation for functions and he maintained the building like a caretaker. Above & below: Mannie as a baby taken in 1912 with his mother Martha Foster and aunt Nellie Roberts. 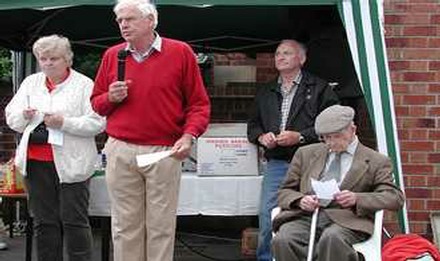 Woodborough Feast was perhaps Mannie’s greatest passion and this is where I first came into contact with him. 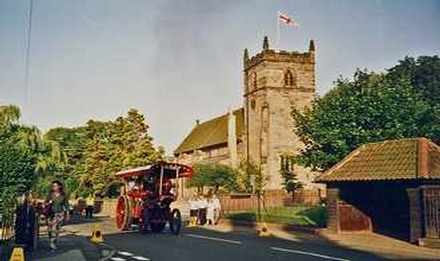 As you know, the Feast of St. Swithun, in Woodborough, is celebrated over several days with the Feast Sports, the church Feast Services and the Steam Evening. As a teacher of Physical Education, I volunteered to help organize the sports. Mansfield was chairman of the Feast Sports Committee which organized various fund-raising events to fund the annual sports day and children’s & adults’ tea party. Mannie was involved in this sports day as a boy and then as an organizer, for the whole of his 94 years – some service – without his efforts I wonder if this lovely village tradition would have survived. Mannie loved his salmon sandwiches which were prepared specially for him in his later years and he never forgot having burnt sausages at the annual Feast Sports Committee barbecue had in recent times. Mannie’s contribution to the village as organist and bell ringer at the church Feast Services must not be forgotten and the dedication on our church organ – the Mansfield Foster Organ – demonstrates our appreciation for his services. But his finest memorial is the Feast Steam Evening which he has organized for so many years. 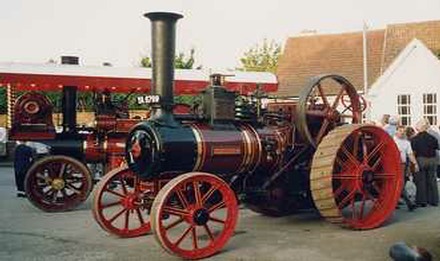 A great deal of time, expense and effort was expended by Mansfield throughout the year as he visited steam events and meetings to persuade his friends – many of whom are here today – to come to Woodborough for Mannie’s Steam Extravaganza. People came from miles around and sometimes the evening ended with a grand fireworks display. Refreshments for the showmen were served from Mannie’s car boot and Mannie presented funds raised to Woods Foundation School, Heart Research and other grateful charities. members of the 2000 Feast Sports Committee. The importance of the Feast celebrations to Mansfield were perhaps demonstrated by a little conversation at a Feast Sports Committee meeting a few years ago. Nora Clarke apologized to Mannie because she was going on holiday and would be missing the Feast weekend. Mannie was quite upset and could not understand how anyone would want to be away from Woodborough for the Feast. His final words were, “Nora, you can’t go away for the Feast, you will have to rearrange your holiday”. Mannie’s contribution to the Local History Group was immeasurable. He was a founder member of the Association and contributed a great deal of materials, documents, photographs and knowledge of the development of our village. His talks were always extremely informative and his memory of people, dates and events was astounding. It is thanks to Mannie, among others that the Group continues to thrive today. Mannie’s contribution to village life was not solely the activities mentioned so far. 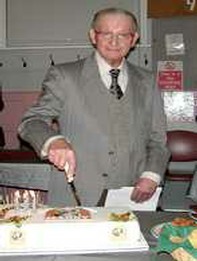 He was a regular member of the Wednesday Club and loved to play cards, dominoes and partake in the quizzes and outings. He entertained the members with his memories, tales and ditties and led sing songs with the piano. Indeed, he was still playing the piano in the care home at Burton Joyce until shortly before his death. In the early days of the Institute Mannie organized dances and whist drives in the village and visited other local villages to support them. He played the organ for church services, weddings and funerals until quite recently. Mansfield had two sets of skittles made for village events and these are used regularly. His weekly visits to Farnsfield for specially baked bread for several villagers and his regular visits to sick friends or house bound invalids to offer support show his caring nature. Such visits were usually made with gifts of cauliflowers, cabbages, plums, damsons, apples, strawberries, etc. I personally will never forget the support he gave Eva and me when I was incapacitated for several months following my bad car accident some 11 years ago. 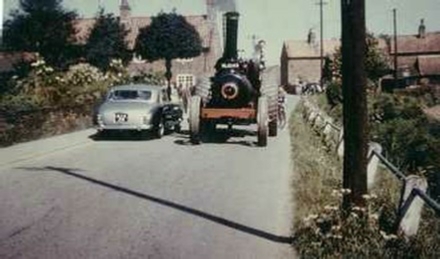 Mannie loved to visit other villages to see the churches, village shows and steam fairs. When he had to give up his car it was a great blow to him but several of you, his friends, still visited him and took him on days out. Thank you all for that kindness. Mansfield’s memory will forever live on in this village and beyond in so many different ways. The Feast Celebration, the Institute, the Local History Archives, the church and the community at large ensure he will not be forgotten. Thank you old friend for all that you did for this village and its community. God bless you and may you rest in peace. The Photographic Recording Group was formed in 1999 to record photographs, then later to write about the village, its people, traditions and history. Who better to turn to for help and inspiration but Mannie Foster? I would visit him at his home on numerous occasions They were never wasted visits as he could talk about any subject. You only had to mention a word or a subject, it could be a building, a person, the Church organ, and he was off. Our conversations were always fascinating and he rarely repeated himself. I found it best to let him talk for 10 or 15 minutes on a subject, and as he did. I would be feverishly writing notes. I then would wait for him to draw breath, and then ask him about something else and so we would go on time and time again. His memory, his knowledge and his love for the Village was immense. I frequently came away with a small bundle of photographs with many notes and when I had finished copying them I then found that was a good enough reason to take them back and repeat the above described. I received some correspondence from someone in Essex enquiring if I knew whether or not a certain variety of strawberry, Sir Joseph Paxton, was still grown. Not being a horticulturist I asked a few people I thought might know. None did. Then a suggestion came that Mannie might know. This was early on in my association with Mannie and I was unaware that he had been a market gardener. So another visit to Mannie's house was called for. His reply to my question quite surprised me. He not only knew the variety, but he had grown it himself in the '50's and he knew the field and the row in that field where they were grown. He went on to explain that some varieties were only suitable for local sale because they bruised easily while others that didn't could stand being taken without damage to Nottingham by carrier . Mannie added that he doubted that the variety in question was still grown. Mannie lived in Woodborough all his 94 years whilst I, a mere 'incomer', for only a few years. It mattered not to Mannie. He was so passionate about the village, and he was so pleased that records and photographs were being maintained and he was so happy to be a part of it. He visited me on a few occasions and I took the opportunity to show him what and how we maintained our records of photographs and articles. He understood, not in any great depth mind you, but sufficiently to know they would be there for future generations. This will be his legacy, to leave his photographs and memories for the people who will follow. In April 2003 I became aware that I had not seen Mannie for some time, nor had I heard of any preparations for the Feast Steam Evening. He was always out and about, often seen on Main Street or in his car or at the Post Office. I knew there had been no mention in the 'Newsletter' about the event and so I decided to call and see him not then knowing he was unwell. His nephew Bruce answered the door and said his uncle was ill and in bed, but I was invited up to his bedroom. Following a conversation about his illness I asked him if he would like the Steam Evening arranged for him for this year. He agreed to this knowing that many village children would be disappointed if the event did not take place. He gave me his list of telephone numbers and told me who to contact. I received firm promises from many that they would come for Mannie. I visited Mannie several times to let him know how things were going and he was greatly cheered that the event was going ahead. However, it was also obvious that this might be the last Feast Steam evening that Mannie was involved in. As we got nearer the day countless people stepped in and lent a hand. Stephen Smith arranged for the church bells to be rung to start the event at exactly 7.00pm. Mannie's neighbour brought along balloons for the children and the event finished around 9.45pm with a stunning firework display. It also truly felt as if the whole village turned up. The weather played its part by providing a perfect summer's evening and to cap it all, Mannie was able to attend, even though he was a bit wobbly on his legs. 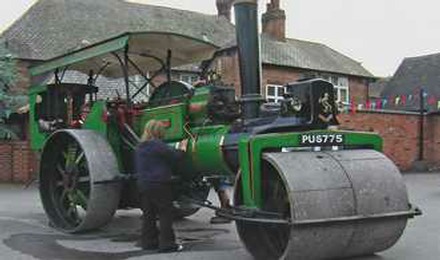 From 2005 the event has been organized by a sub-committee of the Woodborough Community Association, but is now held on the third Saturday of June, this being a more convenient date for the showmen. The tradition continues in Mannie's memory and long may it last. Mannie died about two weeks before the 2006 event. As a ‘newcomer’, I feel privileged to have known Mannie, to have had his support and enjoyed his company and, above all else, to have had his confidence that the Group would treasure his records for the benefit of future generations. Far left: 1968- Mannie centre front in the Parochial Hall for the Harvest Supper. Left: 1947- Mannie aged 35 near Ploughman Wood. When Margaret and I came to Woodborough, some twenty years ago, one of the first things we wanted to do was to find out more about the village in which we had come to settle. A W.E.A. class was held which showed how to do some work on local history and so led to the establishment of the Woodborough Local History Group. The early members were mostly villagers who had spent all their lives in Woodborough, encouraged by Mannie Foster who was so pleased to find that someone was interested in village history. His amazing and almost photographic memory of people and events proved invaluable in encouraging others to contribute their memories and one of the first outcomes was a Village Trail guide. Over the years this has been revised, extended and improved and has now reached its third edition. An earlier W.E.A. class had concentrated on an analysis of Census data for the nineteenth century and it was hoped at first that more detailed research might be undertaken by members. Margaret Bagley followed the Nottingham University Certificate in Local History, using Woodborough for the basis of much work, and Mannie Foster, Jane Turner and Peter Saunders were particularly valuable in contributing information for this. The Group's programme became more oriented towards monthly talks generally concerned with local history but the approach of the Millennium year gave an impetus to more detailed work and a small team set to work to photograph all the buildings of interest in the village. This led to the creation of the Photographic Recording Group and the development of a website (www.woodborough-heritage.org.uk). Since then the website has become a significant source of recorded information about all aspects of village heritage and is backed up by an extensive library of digital images. These have been used to provide several photographic show presentations, exhibitions and printed material. Mannie was always an enthusiastic supporter and an invaluable source of information. Although he may not have understood the technology involved he was always pleased to be asked for help and to contribute his own memories of times gone by. We were constantly amazed by the quantity of photographs and documents that he could find when reminded of an event or a topic and will always be grateful for his contributions to the Local History Group's programme, not least his performances on the piano in The Institute to complement our meetings! 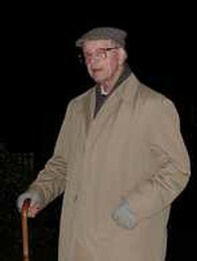 David Bagley was the first Chairman of the Woodborough Local History Group. Mannie joined the choir at St. Swithun's when he was six or maybe seven years of age. He probably attended church with his parents although they were originally Methodists. In the 1920's Mannie would be one of perhaps twelve boys along with a similar number of men who formed the choir. (No ladies permitted in those days). As his musical skills developed he undertook playing the organ, at first for Sunday School at the tender age of fourteen, but gradually extended to playing for services. The organ then, was a small pipe instrument which was located on the North Chancel wall behind the pulpit. This was eventually moved to the present organ loft at the West end of the Nave when the choir stalls were added. Mannie's playing duties were intermixed with bell ringing. This, no doubt, needed some compromise as both activities could not be performed at the same service. There is a recollection that he tended to ring for the 6pm service – this being one of four during the course of an average Sunday if one includes Sunday School in the afternoon. The clock winding task also came under his wing, as did flying the appropriate flag above the tower as the High Day demanded – the latter something he did on occasions as an octogenarian, much to the consternation of many. Mannie's Anglican heritage was firmly rooted in the traditional services. For him there was no substitute for the King James Bible and the 1662 Book of Common Prayer. He was, nevertheless, always keen to expand his library of church organ music; taking regular opportunities to purchase material when visiting London. In 1986 he celebrated 60 years as an organist. He never took a stipend for his duties; preferring no doubt to consider it a matter of service to a church he loved. He was awarded a gift by the congregation at the time of this momentous anniversary. That gift was a television set – something he had never owned up to that point. Mannie's belief in the importance of village life and the events that cement it together are well documented elsewhere. This, however, was equally important to him in the church's role. He promoted and played for the Sunday School Scholars day every July and rang the 'Pancake Bell' in the Old Vicarage on Shrove Tuesday. By Norman Tyler a recorded interview by David Rose on 10th April 2007. I have lived in Woodborough all my life and I’m here to talk about Mannie – J M Foster, market gardener. Mannie and I go back a long way. I can remember Mannie – I didn't know him personally then, but I was at Woodborough Feast with my mother and Dad and brother and sister and there he’d be at the Ashley's Noah's Ark or the coconut shy or the swinging dolls, oh they were really wonderful times! The Feast used to be held in the Governors' Field or Broad Close and Mannie was always there. Now we come to it, probably I got to know him about when I was 13 or 14. 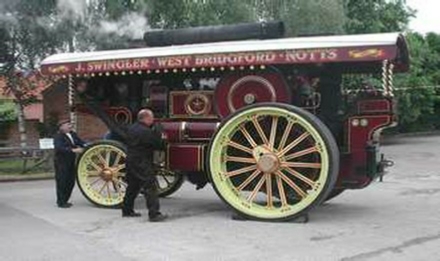 My brother Bill Tyler and George Louth started repairing his steam engine which he’d bought at Calverton. He’d bought it to save it being scrapped and we went over and we cleaned it up as best we could and turned it over and oiled everything and that was my first start getting to know Mannie. 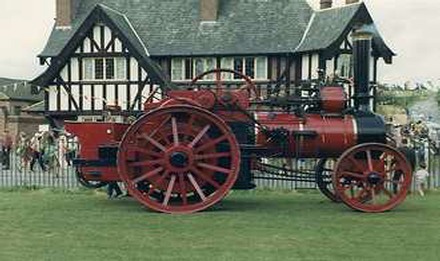 We spent a lot of years with the steam engine, along with a bloke from Gunthorpe who was the first man to show us what to do. His name was Jim Proctor. 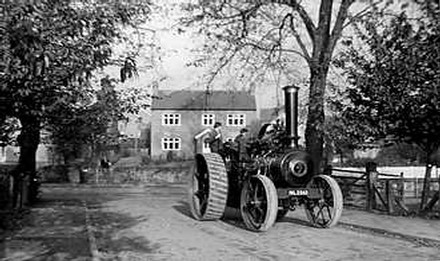 He used to drive a steam roller in those days and he came up show us all what to do, how to drive it and everything and that's when we started. We took it from Calverton down to Gunthorpe and it stayed at Gunthorpe for so long, opposite where this Jim Proctor lived. 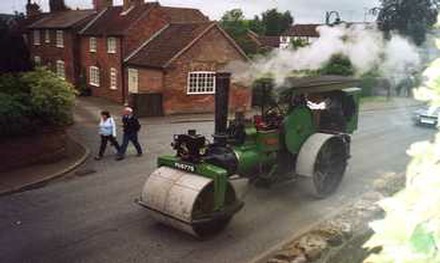 But Mannie wanted it back at Woodborough, so one weekend we steamed it back to Woodborough. There were people in Woodborough who never thought it’d get here. 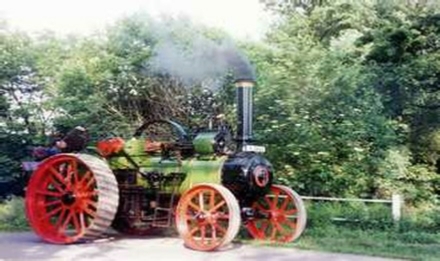 They thought Mannie was just all talk, but not Mannie, not when it came to a steam engine! Anyway we get on a bit and I used to go and help him mowing the orchard with a Mountfield Allen scythe. We used to go damson-picking, plum-picking, raking the ground for carrots – I didn't like that job! Mannie loved it, raking the ground over so he could put his carrots in and small seeds. We used to go strawberry-picking, pea-picking, every fruit-picking you could think of. Then we'd get towards bell-ringing after I was 15. I started learning how to bell ring with Fred Nurcombe. Mannie was always there along with George Louth, Bomber [Bernard] Limb. On Saturday afternoons Mannie would pile us all in his car - five of us at least - George Louth, Bill Tyler, Norman Tyler, Bomber Limb and Mannie, and off we'd go to South Scarle and we'd go and ring their five bells. First time we went, they hadn't been rung for a few years and we had to clean them first before we could ring them, oil them and everything. We'd call at Newark on the way back at the Clinton Arms and have sandwiches and half a shandy. Believe it or not – the first time I travelled at 70 miles an hour was with Mannie Foster, way, way back on the Fosse! We'd come down from the aerodrome, down that slope there, doing 70 miles an hour and a lot of people didn't believe me, because they didn't think Mannie could go that fast! But he did! We come towards my getting married in 1962 - June 23rd. So we’re having a chat with Mannie in 1961 and he’d got a little cottage to let – 3 Church View. Now you’ll not know where 3 Church View was, ‘cos it’s no longer there – back of the Old Post Office, opposite the church. There were three little cottages in a row and then there was the old pub – The Bugle Horn – next to the road. Mannie owned all four of them. He’d bought them from his sister Kath for £400 and then I decided – we decided, my wife and I – that we'd have the centre cottage. It wanted quite a bit doing to it and Mannie had it re-wired. The toilet was down at the end of the yard near the Main Street actually, just at the back of the pub and you used to have to walk round and down there evening or morning, whatever the case may be. Well, we rented that from him for 15 shillings a week and we only managed to live there – we got married on 23rd June and we'd had the house quite a bit before. I spent £50 on it, putting sliding doors in and this sort of thing and cleaning it up, which was a lot of money, but then Basford Council, as it was then, decided the cottages were no longer needed and they issued a demolition order. Well, that really upset everybody but being as they were the bosses, they decided to sell it. Anyway, they offered me a flat at Calverton and I turned ‘em down. Turned ‘em down twice in fact, but that’s beside the point, ‘cos I’d had one or two of the ladies in Woodborough say “you stay where you are Norman”. They were building the bungalows [Roe Hill] at the time – the old folks' bungalows – and Mannie said the same thing “stay where you are until they actually find you somewhere in Woodborough” - which they did. Anyway, to cut a long story short we went down to Lowdham Lane and we lived down there eight years. Mannie used to come and visit us for one night a week at least, probably sometimes two, and he’d sit there and he’d have his cup of tea and his cake and he’d be chatting away about old times right back and “what are we going to do with the engine next weekend?” and all that sort of thing. And then I’d got to be at work early in the morning, so had the wife, so at about 10 o’clock I would say “well Mannie I’m going to bed, lock up when you go” and he’d grin and he’d get up and off he’d go. This was just what Mannie was like, and this went on for a long time. Then come one day he offered me a piece of land, where I live now, which was the greatest thing that ever happened to me. Had it not been for Mannie, I’d probably not be in Woodborough. I’d probably have bought a cheaper place somewhere else. So, I went to live up Private Road, not far from Mannie, which made it a lot easier to see Mannie. I could go down and go across to where the engine was. I could go down and see Mannie, help him out, do anything he wanted doing, and in his latter years I used to try and visit him at least once a week, if possible. Sometimes I’d visit a couple of times a week and we'd talk about the old times, the old fairs – “things are not the same” he used to say and even when he went into a [rest] home, I used to visit him and have a good chat with him. He was always the same – he loved to chat about the old times and what things were and I shall never forget Mannie. When he went to the Nursing Home I went and talked to him, but it was very hard work in the Home because he’d gone slightly deaf and you sat in the main lounge of the Home and you had to shout to him. Well, you got everybody else joining in. All the other people wanted to tell you things, so you were in a full conversation before you’d finished. I don’t think he really liked it in there but anyway, I’ve got my happy memories of Mannie and I don’t think I shall ever forget him, and I think that just about sums him up. This is the full text of Norman Tyler talking with David Rose, David recorded the conversation for Norman's tribute to Mannie. 1980- Mannie in the Manor House grounds with the Manor Farm buildings in the background. 1985- Playing the 'New' organ at his own retirement! But his retirement didn't last long. My earliest recollection of Mannie Foster was of him being organist in the 1930’s. He played for both morning and evening services unless, in later years, he was invited to play elsewhere. He played the piano for Friday night’s 6d dances in the Old School, with the partition pushed back, long before any thoughts of a Village Hall. When the Church Hall (now Scout Hut) arrived with its beautiful floor, all dances were held in there with Whitehead’s Band. This did not make Mannie redundant as he masterminded village concerts in this lovely new hall. Today, he would have been listed as “Musical Director, Producer, Stage Manager” etc. I remember rehearsing in the sitting room at The Manor, which was his family home. One of his favourite songs from those days sticks in my mind as we sang it again when I visited him in the Nursing Home approximately 2 weeks before he died. This was some 60 years after first singing it with his concert party. That was Mannie. He had a most remarkable memory and loved recalling stories of Woodborough and some of the characters of those days. 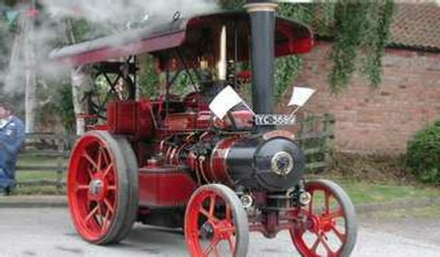 Steam engines were another part of his life and he had “steam friends” from miles around. Some of these brought their engines to village events. He was so respected by them they could not say “no”. He loved the days when Woodborough Feast meant Ashley’s Gallopers and sideshows came, either in Broad Close or the Governors’ Field. 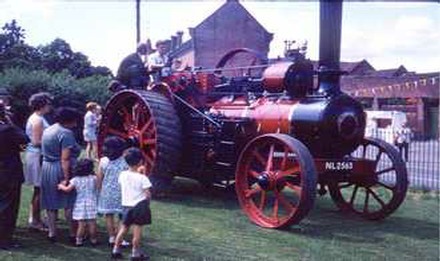 I am so pleased he lived to see the “Steam Evening” which he started, revived, and hope it continues to grow for many years in his memory. Mannie is 5th from right at the back. I first became aware of Mannie Foster in July 1972, soon after coming to live in Woodborough. It was at the Feast weekend. In those days, the Feast was held over three days, Saturday, Sunday and Monday, which was a day’s holiday for the school children. 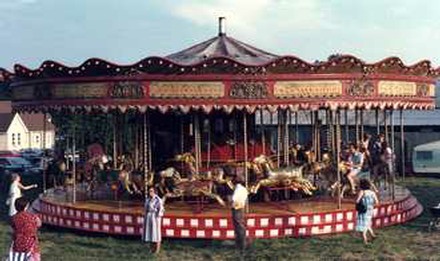 There were roundabouts and stalls on the Governors’ Field, also a steam fair on the Monday evening where Mannie used to have his steam engine on display. All the activities were organized by Mannie and a few other people from the village, including Feast Sports, on the Saturday afternoon. His family had a long association with the sports and the tea for the school children. About a week before, Mannie could be found around the village collecting prizes for the raffle which was held along with the sports. The proceeds were used to help the small monetary prizes given to the winners of the races. There were also refreshments in The Institute, provided for the people who lived on Roe Lane and for the showmen who brought their steam engines etc. In about 1985 I helped form the Local History Group and Mannie turned up at the initial meeting and he was a huge help. This was when I got to know him better and discovered his full name was John Mansfield Foster – John after his paternal grandfather and Mansfield after Mansfield Parkyns of Woodborough Hall. I often used to pop in to ask him something and spent many happy hours over a cup of tea, as the kettle was always on a low light just in case, listening to his stories about the village and its occupants. This led me to researching some of the families that lived in the village. I believe Mannie’s family had been in Woodborough since the 1500’s, possibly coming from the Newark area. Mannie retired from playing the church organ in the 1980’s after attending practically every Sunday for over fifty years. There was a special service for him and he was presented with a portable television, this was the first time he had owned one. He used to spend many hours playing the piano, both for the amusement of himself (he lived alone for over fifty years) and other people. He also played for various activities in the village and also at many churches when they were without an organist. One of these was at Sutton on Trent where he used to go regularly on a Sunday evening; afterwards enjoying supper with a lady he knew who lived there. He was a staunch member of the Over-Sixties Club held on Wednesday afternoons at The Institute. He would play the piano there for them to have sing-song. At this time The Institute had a pot-bellied stove for heating, which had to be stoked up with coke. Mannie did not trust anyone else to do this job so he would turn out in all weathers if there was to be a meeting. He didn't like change and was very upset when he eventually had to have the stove taken out and a safer form of heating installed. One freezing morning my doorbell rang and I opened the door to find Mannie on the doorstep. I told him he looked frozen and asked what he had been doing. “I’ve been tattering” (potato picking) he announced. This was when he was well on his way to his ninetieth birthday! He liked to have a drive out in his car, which he drove well into his nineties. He used to say “never drive faster than ten miles an hour down the Main Street”. Latterly, when he had to give up driving, I used to take him out. He liked to go to Lincolnshire, but whenever we went we had to visit the church where he would have a time playing the organ if it was workable. One of his favourite places to visit was Haxey in the Isle of Axholme, where they hold the Haxey Hood Game, which he liked to see. Before arriving there we used to have to go and have lunch at the tiny Teapot Café in Epworth and the lady who owns it used to make a great fuss of him. One of Mannie’s yearly jobs (self-appointed) was to climb into the church bell tower on Pancake Day to make sure the Pancake Bell was rung. This is something he was doing well into his eighties. He amazed me with his knowledge of the roads. I think he knew every twist and turn. We used to have to use the old roads which he knew from his early driving days. He told me many stories of driving with his father about the countryside and I think they must have had a great relationship. Mannie could be very stubborn at times, but then he only had himself to please. Sadly, I only got to visit him once after he had to go into a rest home and I am still not sure if he knew who I was. I think of him frequently. May God rest his soul. 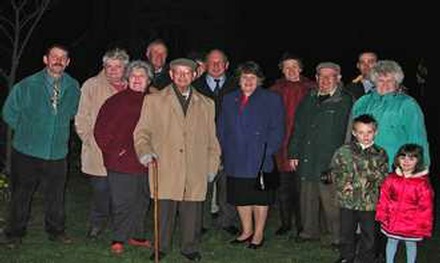 2002- These photographs were taken of Mannie celebrating his 90th birthday, on the left in the Institute cutting his cake, top and right in Governors' Field where the Beacon was lit in his honour. I have known Mannie all my life. 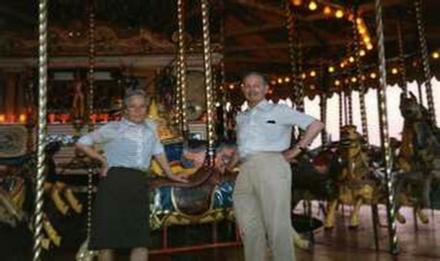 My earliest recollection was as a child Mannie telling us to get our bikes out because the feast was coming on Feast night and him giving me 2 silver threepenny bits to have a ride on the cake walk and steam gallopers. He was a very clever man with a terrific memory, kind and caring to a lot of people. Everyone who knew Mannie will have fond memories of him, because he was a one off. 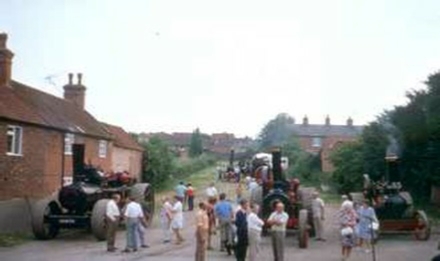 The following sequence of photographs of Woodborough Steam evenings were taken between 1977 & 1992. 1990- Mannie in the Institute stoking the old coke heater. 1927- Mr & Mrs Charles Foster with their children Ernest, Charles, Kathleen & Mansfield taken in front of the Manor House. 1929- Mansfield on the right with his Uncle Peter in the Manor House gardens, the Four Bells can be seen in the background. Left: 1970- Here on the Church tower roof raising St George's flag. 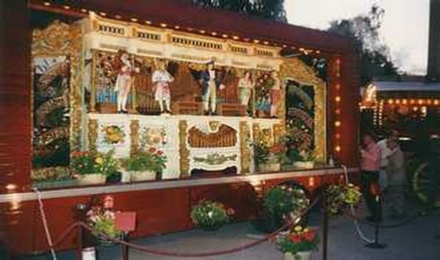 Right: 1970- Mannie playing the Wedding March on the old church organ. I first met Mannie in the early 1950’s when I came to work in Woodborough. At that time Mannie had just sold the Manor Farm because of the untimely death of his brother Ernest; they had been farming and market gardening there for many years. Mannie then built a house in the corner of Broad Close, now called the Meadows. He also retained enough land to continue with his market garden business and attended the wholesale market in Nottingham twice a week. He was an expert grower of quality vegetables and fruit, especially strawberries. His orchard also contained damsons, plums and many varieties of apples and pears. On one occasion we attended the Royal Agricultural Show at Stoneleigh in Warwickshire and he was able to identify the varieties of apples by just looking at them and won a prize of some cuff links embossed with an apple logo. Mannie had a wonderful memory, especially of dates and events and of past happenings in the village. He was educated at Worksop College in North Nottinghamshire, was fluent in Latin and a talented organist and pianist. The new organ in St Swithun’s Church, Woodborough, is dedicated to Mannie in recognition of his over fifty years of playing the organ there. He was also in great demand for weddings and played at our wedding in 1959 and also at our daughter’s wedding in 1989, both taking place in the Methodist Chapel. Mannie often called round to see us, bringing us fruit or vegetables and sometimes would stop and entertain us on the piano – his all time favourite being “I’m forever blowing bubbles”. He saw some great changes in the village during his lifetime, but was never critical of newcomers or development, but endeavoured to uphold traditional village life by helping to maintain events such as the Feast Sports and Children’s Tea, and also the Steam Fair. He was also a bell ringer and maintained and wound the church clock. He was also keen that flags were flown from the church tower on all special occasions. Thank you Mannie, for all you have done for this village and also for having been a part of our life here. I have known Mannie all my life. My earliest recollections are when I was about five or six (in 1938) and it was the Feast weekend. 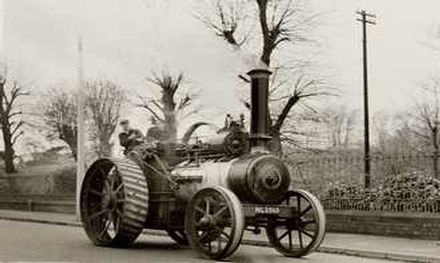 On the Tuesday or Wednesday before, we used to run and meet the fairground steam engines and run alongside them going up Main Street to the Broad Close Field, just beyond the farm. 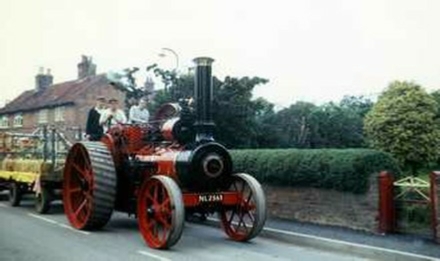 Mannie was steam-mad and he used to take us to Rempstone to see engines at Beeby’s farm. Time went by and in the 1940’s Mannie used to play in a trio in the Parochial Hall. Mannie played the piano, Penson the drums and Nev Ward (Tom’s Dad) the cornet, at what they called “Bob Hops” (one shilling admission). In 1948 I left the old Woodborough School and went to work for the Foster family at Manor Farm next to the Four Bells. The work was market gardening, i.e. setting Brussels, cauliflowers, cabbages and kidney beans. The brassicas were all set by spade. Mannie’s brother Charlie and I planted the Windmill Field – all seventeen acres of it – on our own. When we had harvested the vegetables we used to sell them at the wholesale market in Sneinton, Nottingham. I used to go along with Mannie in the mornings at 4.30 a.m. after waking him up by throwing pebbles at his window. After a bowl of porridge, we would wend our way to market. 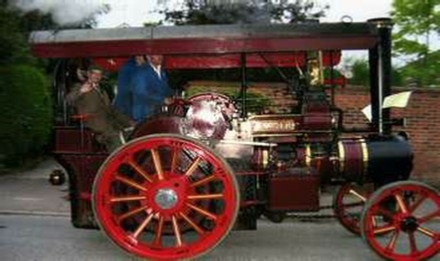 The final two sequences of photographs are all of Mannie's engine between 1957 & 1984. My parents were quite friendly with Mannie’s parents, at least until Mannie’s mother died in 1932. A letter recently surfaced when Mannie’s house was being cleared. It appears that when he went to Worksop College at the age of 12 he wrote to my father to tell him what life was like at the College, and my father replied to it in a letter dated 5th February 1925 which for some reason Mannie kept and is now in my possession. In it my father, A.W. Saunders, mentions me, I was 8 months old at the time, so Mannie knew me, and I him for most of our lives. I knew Mannie mainly through his work on the farm [Manor Farm], his organ playing at the church [St Swithun’s] and latterly through my contacts with him at the Woodborough Local History Group. As a boy he learnt by heart the Collects for each Sunday’s service and in the letter my father encourages him to continue doing so. Obviously, Mannie’s religion played a big part in his outlook on life from an early age. With the Manor Farm virtually surrounding the School House where I was born the fields were my own adventure playground and with Mannie and his brothers working on the farm I was constantly in their company. 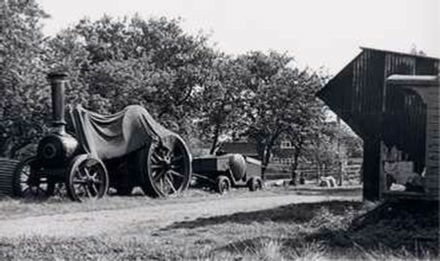 This was in the era of the horse before the advent of the tractor, although a lorry with high side rails was used to take their market garden produce to the Nottingham Wholesale Market. The small field next to the School House was invariably used for growing either cauliflowers or Brussels sprouts. With cauliflowers Ernest and Charles [Foster] did the cutting and Mannie packed the cauliflowers in tiers on the lorry where as a child I often joined him. His packing was a work of art and precision. He would count them by putting a knot in a piece of string hanging on the side rail every so often and would pack 50 dozen cauliflowers in tiered rows. Mannie took his turn with the men picking the Brussels sprouts, often when there was snow on the ground, and doing that for hours in the freezing cold really needed stamina. My mother would make a jug of tea and take it to the hedge dividing our home from the field, gave the pickers a call and nearly always Mannie came to collect it. There was invariably a cauliflower or some sprouts with it as a thank-you when the jug was returned. In church, when I was a young boy, we always knew if it was Mannie playing the organ. My mother, a contralto, particularly appreciated his playing of the psalms, he must have sung along with them as his pointing was always accurate. In more recent times, whilst researching the history of Woodborough, Mannie’s amazing memory provided me with a constant source of information. His memory for dates and events that occurred during his lifetime of births, marriages and deaths of the local inhabitants was phenomenal. Unusual weather involving floods, severe winters, or droughts and hot summers with their effects on the hay, and corn harvests, or on any of the usual agricultural routines was stored in his memory. His interest in the behavioural mannerisms of departed inhabitants was related as if they occurred yesterday, vivid but never malicious. If we had both known some eccentric village characters he would suddenly produced their catch-phrases to jog my memory. I owe such a lot to Mannie, his kindness, moral principles and good humour, someone who you could never forget. 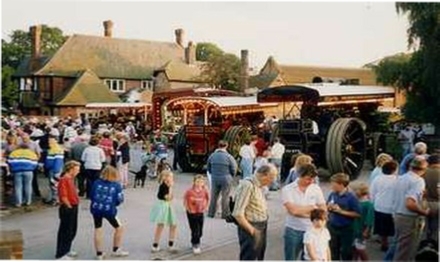 Mannie’s aim was to provide enjoyment for the children of Woodborough and there is no doubt that he did just that, but the Steam Fairs were not just for the children, the adults enjoyed them too and the event was always very well supported. Well done Mannie and thanks. This concludes the testimonies to John Mansfield (Mannie) Foster who died in 2006 aged 94; we thank all who contributed their personal recollections and the wonderful selection of photographs.